MIAMI–YOTELPAD Miami has added the country’s first Techi Robot Butler in a hotel and condo development. Designed and developed by robotics solutions company, Techmetics, the service-oriented robot will work alongside staff to make deliveries to the property’s 231 residences and 222 hotel rooms. The Techi bot is automated to interact with people and will be located at YOTELPAD Miami’s sales gallery until the development’s completion, which is slated for 2020. 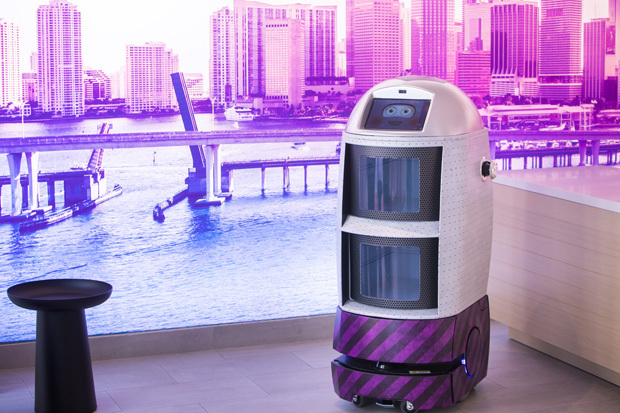 The YOTELPAD Miami sales gallery currently has one robot and upon completion, the mixed-use development will offer three Techi robot butlers. Two robots will be available to residents and one will be designated to guests of the hotel. Both residents and guests can contact and track the robots through a user-friendly app control. The two-compartment robots are designed to ride the elevator and capable of delivering loads up to 77 pounds including beverages, food, treats, gifts, documents, and more. In addition, they can be programmed to speak a variety of languages, dialogues, and play digital files with music and voice recordings. During their downtime, the robots will roam the lobby, engage in conversation, play music, and pass out treats. YOTELPAD Miami will be the first of YOTEL’s mixed-use developments in the United States to offer a Techi robot butler by Techmetics.